not a big fan of this one. I just didn't like the flavor of the marinade, and neither did my husband. I marinated the chicken overnight in the refrigerator, then made kabobs with it for a party of 15... EVERYONE loved it and asked for the recipe. Thanks so much! I marinated it closer to an hour and added a garlic & onion seasoning blend to the marinade. This was delicious!!! The chicken was rather moist too! Will definitely be making this again! Yum! I used two limes, three garlic cloves and two tsp. honey. We loved it! This made a very moist grilled chicken, I only marinated it 30 minutes like the recipe called for and you could taste the beer. I marinated the chicken for about 45 minutes. My husband and I both liked this even though we aren't big on garlic. The chicken turned out moist and had a nice flavor and aroma. 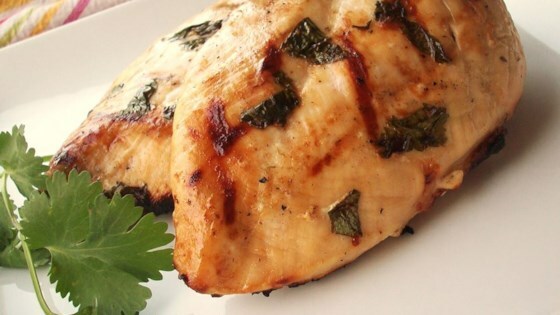 THis is an amazing marinade! I left in the fridge for thirty minutes like the recipe says and The family loved it! Thank you!